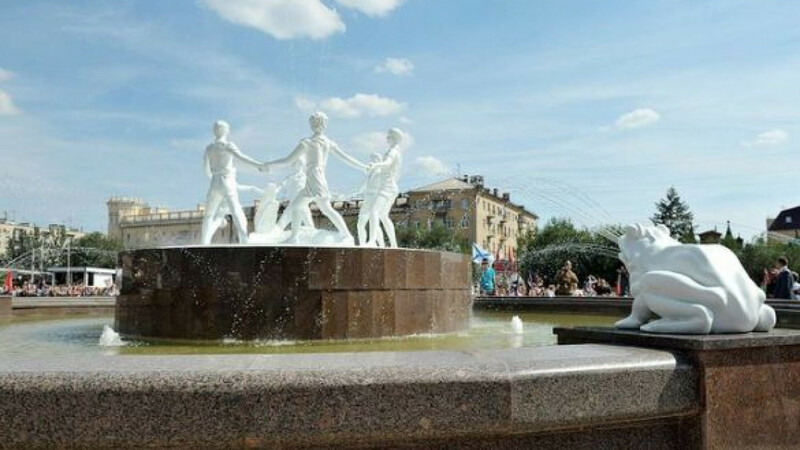 A copy of the Children’s Dance fountain sitting on a square in Volgograd. A replica of an iconic fountain in the southern city of Volgograd has been closed for repairs less than a month after being unveiled in a ceremony attended by President Vladimir Putin due to defects in the construction. A photograph of the Children's Dance fountain, taken by Emmanuil Yevzerikhin on Aug. 23, 1942, conveyed the devastation of the Battle of Stalingrad with an image of the fountain standing miraculously intact with the bombed-out city in the background. The fountain was later destroyed by Soviet authorities and remained a footnote in the pages of history until Alexander Zaldostanov, head of the Night Wolves motorcycle club, proposed resurrecting the pastoral ensemble. An exact replica of the fountain was made, and Putin traveled to Volgograd to attend its unveiling on Aug. 23 — 71 years after the famous snapshot was taken. He met with World War II veterans and gave a short speech, saying the fountain had symbolized “joy, life and the carefreeness of childhood” before the war and then became a symbol of Nazi “barbarism” because of Yevzerikhin's photograph. Less than a month after that ceremony, the statue's lily-white surface has become marred by splotches of rust that have appeared due to defects at the junctures between the sculpture and the fountain's base, RIA Novosti reported Tuesday. Water has also seeped into the fiberglass-reinforced plastic bodies of the children. "We did not consider this and used unprotected metal, which rusts," said sculptor Alexander Burganov, whose studio was commissioned for the project. "We take responsibility, myself included. We should have anticipated this, but nothing is lost yet, and we will restore everything." The sculpture is set to be re-opened to the public in October.